Having read Robert Waggoner’s “Lucid Dreaming: Gateway to the Inner Self” has reminded me that other lucid dreamers out there wonder about the possibilities that come with altered states of consciousness. It has also made me realise how important it is to not only try to acquire experiential evidence for what could be possible, but to also communicate and share ideas with other lucid dreamers. It is productive to socialise with people with the same interests - be it in person, forums or via email - as much as it can be mind-expanding to read about other people’s ideas and theories. We are also explorers and we all love to speculate. On one hand, I have no doubt that lucid dreaming can aid self-integration as well as inspire creativity. On the other hand, I feel that we must also consider the possibility of becoming aware of other levels of reality via this elusive state. I’m not talking about different levels of the astral plane or any of the ideas conveyed in esotericism. I’m talking about possibly of accessing a wider perspective within a reality network. Discovering the connectivity and acquiring some understanding or even an inkling on how it works. Apart from being able to communicate with the inner self that may run the show, we may also be able to get closer to a state of oneness with everything, and, in doing so, become familiar with the inner workings that facilitate the eventuation of seemingly far-fetched concepts such as telepathy and precognition in the lucid dream state. Of course, I’m going under the assumption that such things could be possible as they haven’t been ruled out so far. For that reason, I continue to explore and have devised my own plan to carry out experiments that will put the many ideas and theories that we share to the test. Last night I was wondering if shared dreaming is possible. Me and my wife have experienced what could be regarded as such on a couple of occasions, but, as striking as the coinciding elements were, the evidence of real contact between the two of us in dream space was not strong enough to rule out mundane explanations. Still, I am open to the idea, and, before bedtime, I had a strong desire to lucidly enter dreamland, visit Stacey in her own dream space, and make her lucid too. I did become lucid in a dream but failed to remember my task. However, something interesting did happen which I’ll recount in detail, and, in hindsight, it suggests that a deeper unconscious force responded to my curiosity and might have pushed me (the waking self) to take certain steps in digging deeper and getting to the bottom of all that I’ve been wondering about. At 5.30am I woke up to use the toilet and after about ten minutes I went back to bed to induce a WILD. I was feeling a little tired and slightly worried about oversleeping and being late for work. I fell asleep during a meditative exercise and began to dream about having travelled to Portugal with my mother and trying to help my brother-in-law’s brother, Rui, to steer clear of drugs. In the dream, Rui was very thin and didn’t look well. In reality, he’s rehabilitated and is a happier family man. Looking back, there is nothing odd about this dream because it sort of reflects what I had been discussing with my mother over the phone before bedtime. She is helping my cousin Revelino to beat his drug addiction just like she helped Rui years ago. Revelino wants to move forward in life and so far he’s been cooperative. The dream seems to reflect the conversation that me and my mother had. I remember telling Rui, in the dream, that he needed to eat. After that, I went for a walk in what I took to be my birthplace, Oporto. I was walking alongside a river, and, as I beheld a metallic bridge looming in the distance, I felt lost and couldn’t figure out my way back. That feeling of being lost suddenly seemed familiar. I remembered saying to myself once that if I felt lost again I’d do a reality check. Bam! I was lucid when I realised it was one of my dream signs. The river, the bridge, the city and the sky were now crystal clear. I appreciated the exquisite beauty of sunlight being reflected by the river and yet the sun was nowhere to be found. I knew I had something to do or somewhere to be but couldn’t remember my plan. I was standing on a concrete pavement, rubbing my hands together, when a group of lads emerged from behind and jogged past me. They laughed and conversed with one another as though sentient and oblivious to my presence. This aroused my curiosity, and, although one might say that the dream figures distracted me from remembering my plan of action, what followed, in a sense, suggests that the unconscious mind prevented me from distracting myself with a plan of action and might have nudged me in the right direction of focusing on something else which might prove to be more important or urgent. As the men were running uphill I shouted, “hey, you… wait!” One of them stopped while the others continued to run and disappeared. The character who seemed to have heard me turned around and walked towards me. He was a colossal Caucasian man, of muscular build and sporting short blonde hair. “Who are you?”, I said. He was frowning and replied in an angry tone: “Who am I?” He looked like he was going to hit me so I repeated my question. Finally, he divulged: “I am the part of you that tries to understand”. I was confused by this statement. Understand what? Before I could ask him to elaborate, the jogger began to decrease in stature and turned into a black man simultaneously. His arms and hands, however, seemed to have grown and he used them to grab me like I was a little ball before throwing me in the river. I heard the splash and remained submerged when I realised that I could still breathe. Suddenly, I became aware of a predominantly blue tunnel made of patterned water waves and ripples. I became aware of concentric circles that conveyed depth and saw that there was a long way to go in order to reach the light at the end. As I looked at the water walls of this tunnel, I noticed colourless flower buds and petals of a crystalline nature and my observation appeared to change their protruding shapes as well as the patterns on the walls. I felt compelled to glide towards the distant peculiar light at the end. This attractive shiny speck was surrounded by swirling vibrant patterns of harmonious fluid. These patterns provided a contrast against the peaceful still light that beckoned me and I was like a child who couldn’t take his eyes off the new toy. I began to shift towards the light and the thought of waking up before I could reach it crossed my mind. With that, I returned to wakefulness. I relived the experience in my mind and pondered about what it meant or represented. I wished I had asked the dream character what he tries to understand. Everything perhaps? Maybe I can meet him again in the lucid dream world. What would he look like? Would he continue to be a shape shifter? Then I thought about the possible symbolism reflected in this lucid dream from all the dream dictionaries I’ve perused in the past since my mother’s interest in dream interpretation rubbed off on me from an early age. Could my subconscious have adopted and used that language in order to reflect what is really going on inside me? The angry muscular man image could suggest that I am more set in my beliefs than I realised, and this, although establishing assuredness and a sense of certainty, can be limiting. By addressing this aspect of myself I may have unlocked and acknowledged the side of me that is “in the dark” about things and repressed or hidden - hence the black man. If a step towards unlocking content from the deep unconscious took place then it was an important step. 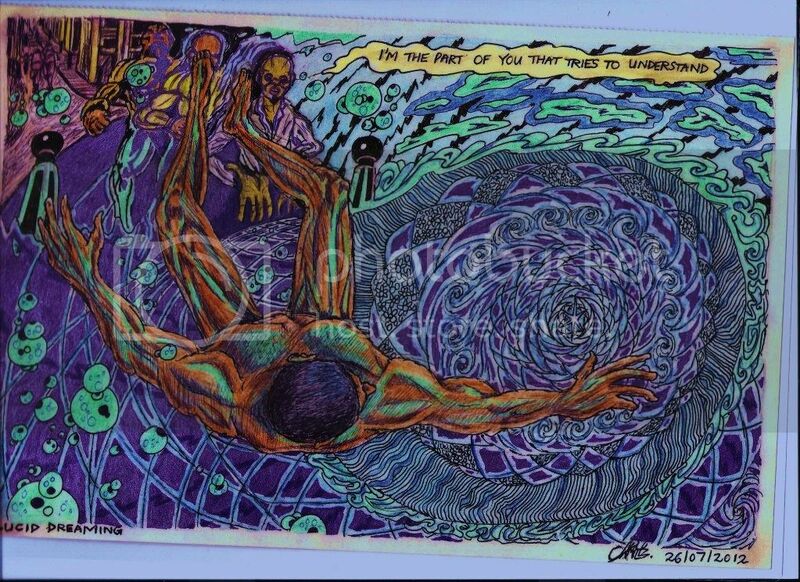 Was the act of being thrown in the water by the black man image a push in the right direction? The black man could also indicate the termination of clinging to certain beliefs and being open to other perspectives. The shape-shifting could indeed reflect my fickle nature or my progression in this journey. Perhaps embracing uncertainty is the best bet until a breakthrough or discovery is made. Did that character herald the path to the revelation of unconscious drives, the mysterious depths of the mind and the inner workings of reality? The patterns of the underwater tunnel could reflect my mind’s inner structure, primordial, symbolic, with the concentric circles amongst the geometric patterns representing wholeness, infinity, continuity, connection, perfect balance - and perhaps, ultimately, the ideal self. The light at the end of the tunnel could indicate clarity and insight. Although this DILD was brief, it is abundant in symbolism and the answers, if one can call them that, may be staring me right in the face. The water environment could convey the inner flow of my very nature. Traditionally, water also stands for emotions, life force, and suggests cleansing. I can also think of constant change, malleability and adaptability. The crystalline flower forms suggest a source of creation. The cool colour blue can be thought to represent infinite possibilities, spiritual development, open-mindedness and wisdom (remember Absolem, the blue caterpillar in “Alice in Wonderland”). Perhaps I was being ’pushed’ towards this as a step towards self-integration. Finally, we have the river, which can symbolise the course of one’s life, and, it flows towards something greater - the ocean… the deep unconscious that drives us. If there is one thing I can be sure of in my lucid dreaming exploration so far is that, apart from being inspirational, it makes me think a hell of a lot about everything and this may be the natural aftereffect of a highly aroused cerebral cortex phase - the lucid state. The patterns of the underwater tunnel could reflect my mind’s inner structure, primordial, symbolic, with the concentric circles amongst the geometric patterns representing wholeness, infinity, continuity, connection, perfect balance - and perhaps, ultimately, the ideal self. The light at the end of the tunnel could indicate clarity and insight. I have only quoted a little of you post, its a lovely dream and has elements that I am very familiar with. The shapes, crystalline plants, light, blue light, light at the end of the tunnel are all very familiar to me. I tend to think of all of them as portals that will take us the dreamer to another part of our mind and there we can begin the lucid journey once more at another level of conscious exploration. To me they are expressions of energy and only a beginning not a sign to be worked out. Do they draw you in if you focus on them? For me If I put my awareness on any of these events (I use event because they are energy to me) I will start to feel some power and energy pulse through me and start to be drawn away and it is one my goals to let this happen. I persistently resist this and don’t know why. Thanks for the replies, guys. I'm glad this seems familiar to you, Peter. I like to think that we are all similar if not the same. I like your interpretation of it being the beginning of conscious exploration and not just some message awaiting to be deciphered. The shapes were certainly intriguing but I guess I quickly shifted my attention to the still light at the end. I wish the dream hadn't collapsed when it did but I'll try to see if I get pulses of energy next time. There could be more to it than meets the eye. Once again, thank you for your input, guys! its nice to share the experiences and one more thought on why I think like I do is that in my experiences these events come to you when you are ready for them rather that you being able to conjure them up at will and that is why I think they are just a beginning.